Cool! Save an average of 20% on OshKosh Bgosh with 23 Coupon Codes, and 21 Deals! 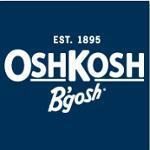 OshKosh B'Gosh was established in 1895 in Oshkosh, Wisconsin. It is widely recognized for selling baby and young children's apparel and in particular their denims and work-style clothes. It partnered with Carters in 2005 and expanded its range of products for its customers. Details: 20% Off $40 or more. Excludes - Clearance, Doorbusters and Gift Cards. Expires on 02/28/2014. Details: 15% Off your next entire purchase. Not valid on purchase of clearance. Expires on 03/31/2014. Details: Get 15% off entire order. Excludes clearance, doorbusters, and gift cards. Expires on 03/31/2014. Details: Friends & Family Sale! Take 25% Off Your Entire Order Sitewide. Excludes doorbusters and clearance. Expires on 09/30/2013. Details: 15% off your entire purchase. Not valid on clearance. Valid January 1-31, 2013. Details & Exclusions: During the month of October, Take 15% Off ENTIRE Purchase. Ends 10/31/2013 Exclusions: Offer cannot redeemed in outlet stores or department stores. Offer applies to full priced merchandise. Online code cannot be used in combination with any other coupon offers, doorbuster specials or entire store discount offers. Discount does not apply to clearance. Purchase must total the required amount or more, net of applicable discounts and before sales tax and shipping fees are applied. Not valid on purchase of furniture, Carter’s at Home products, bath and body care, gift cards, or previous purchases. Details: Get up to 60% off everything. Details: Get Up to 75% Off Clearance. Expires on 03/12/2014. Details: 15% OFF YOUR NEXT PURCHASE OF $40 OR MORE VALID JANUARY 1 - FEBRUARY 28, 2013. Excludes clearance. Details: Get 20% off $40 or more. Excludes clearance, doorbusters and gift cards. Expires on 03/31/2014. Details: Take 20% Off Orders of $40 Or More. Excludes Clearance & Doorbusters. Ends 5/23/13. Details: 20% Off your next purchase of $40 or more. Expires on 03/31/2014. Details: 20% Off your orders of $40 or more. Expires on 03/31/2014. Details: Take 15% Off Your Entire Purchase. Valid only on full-price merchandise. Ends 5/23/13. 20% Off $40 + Purchase. Expires 3/31. Details: 20% Off $40 + Purchase. Expires 3/31. Details: $10 OFF your $50 order! Details: Get Shorts Starting at $7. Expires on 03/05/2014. Details: Earn $10 BGosh Rewards on $40 purchase. In store only. Limited time offer.